As the FCCA meets in Santo Domingo all this week, elsewhere in the Caribbean, a new line called Tropicana Cruises plans to open its operation from Havana next week with the newly-purchased Adriana, which sets out on her maiden voyage on November 6. Back in the Mediterranean, meanwhile, Plein Cap Croisières plans to replace the Adriana with the Vistamar, which it will share with Bremen-based Plantours & Partner. The 17th Annual Cruise Conference and Trade Show of the Florida-Caribbean Cruise Association gets under way today in Santo Domingo, the capital of the Dominican Republic, a city that was founded by Christopher Columbus in 1496, and is the oldest city in the Caribbean. The conference runs until this Friday and two heads of state, 25 ministers and 60 cruise line top executives are expected to attend. The Dominican Republic once owned its one of the earliest Caribbean cruise ships, the Nuevo Dominicano, which it ran from 1948 until 1952, when it sank off Cuba. Today, however, this Caribbean country, which shares the island of Hispaniola with Haiti, concentrates on developing new cruise ports and terminals and resorts and resort hotels. As well as cruise terminal investments by Costa Cruises, the Dominican Republic is well served by flights from Canada and a number of cruises now originate in the Dominican Republic. The newest cruise ship terminal is the $50 million Sans Souci terminal, opened in 2008 near central Santo Domingo while a second is located on the recently-refurbished (2006) Don Diego Quay. A third cruise ship terminal, La Romana, which is managed by Costs Cruises, lies 118 miles to the east of Santo Domingo, between La Romana and the resort of Casa de Campo, and with its own airport attracts cruise calls from Costa and Celebrity. Tender calls are also made at Samana in the northeast of the republic by Royal Caribbean. A major point of emphasis at this year's FCCA meet will be purchasing by its members. "The idea is to deliver a sustainable product to our supplier attendance base, said Michele Paige, President of the FCCA. Our goal is to bring this purchasing initiative to the forefront of our conference." 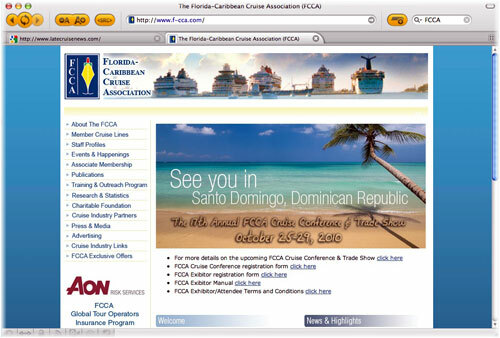 The FCCA's roots were largely in purchasing and this is expected to return at this year's trade fair, with purchasing executives present from all 15 member lines. The Florida-Caribbean Cruise Association's mandate is to foster a better understanding of the cruise industry and to develop co-operative relationships with its destination partners in both the public and private sectors. Kevin Sheehan, ceo of Norwegian Cruise Lines has just this year replaced Micky Arison of Carnival Corp & PLC as its chairman. The FCCA works closely with destination partners in the Caribbean as well as fellow industry groups such as the Caribbean Tourism Organization (CTO), on which the FCCA sits on the board, and Cruise Lines International Association (CLIA). Founded in 1972, its members operate 100 cruise ships, including the largest now in service, and it provides a forum for discussion on the development of tourism, legislation, ports, safety and security and other cruise industry issues. The Caribbean market having always been the bedrock of the cruise market, more news from this conference will follow in next week's Cruise Examiner. Meanwhile, a new British company, Tropicana Cruises Ltd, has recently purchased the 250-berth cruise ship Adriana, and has announced that it intends to offer weekly cruises around Cuba with an outside stop at Ocho Rios, Jamaica. The target market is largely European and Russian passengers, who would be flown to Havana or Kingston to join ship for a 7-night cruise. The Adriana had established a good reputation for herself in the French market, where she had operated since 1997 for Nice-based Plein Cap. Now, beginning on November 6, she is to sail from her new home port of Havana every Saturday, making calls at Isla de la Juventud (Nueva Gerona), Ocho Rios (Jamaica), Santiago de Cuba, Bahia de Nipe, and returning to Havana the following Saturday. Fares will range from €785 to €1690 for the 7-day cruise, depending on the type of accommodation booked. Tropicana is now on the look-out for a number of tour operators who can package up these cruises with flights so they can be offered as fly/cruises on the European market. What is interesting about this development is that while Costa Cruises did invest in the Dominican Republic it had to divest itself of an investment in a cruise terminal in Havana after being acquired by the US-owned Carnival Corp & PLC. It is early days yet, with travellers limited to those from Europe, Canada and Latin America, but eventually the Cuban cruise market will blossom again when Americans are once more allowed to travel there..
Plein Cap in the meantime, having lost the use of the Adriana, have taken on a new ship in the Vistamar, which has been operating in the German market for Plantours & Partner, who will operate her until the end of March 2011. From published schedules, its is evident that the Vistamar will now work part time for Plein Cap and part time for Plantours between April and October and revert to Plantours for the winter season. At 7,478 tons, the Vistamar is larger than the Adriana's 4,490 tons, and she can also carry more passengers with about 300 lower berths, or 20% more than the Adriana. The Vistamar is also newer, having been introduced in 1989 as the Spanish Santa Cruz de Tenerife, while the Adriana dates to 1972, when she was built as the Aquarius for Hellenic Mediterranean Lines. The Vistamar's first cruise for Plein Cap will take place between April 19 and 30, 2011, on an itinerary between Istanbul and Nice.